The Council has announced details of a temporary road closure at Miskin Road in Mountain Ash, in order to safely deliver the main construction phase of the Cross Valley Link scheme. The Cross Valley Link will provide a new road from Cwm Cynon Industrial Estate over the river and Aberdare-Cardiff railway line, linking to Miskin Road. The construction of a 60-metre road bridge will begin this summer, and is planned to be complete in winter 2019/20, providing a key link for traffic on the A4059 and B4275. The major scheme will relieve traffic congestion in Mountain Ash and along the wider A4059 Cynon Valley Corridor – particularly at peak traffic periods. During late May 2018, the project reached its latest landmark as significant improvements to the A4059/Industrial Estate junction were completed. New traffic lights were switched-on following the work, which has greatly increased the junction’s capacity by widening the carriageway to add additional lanes. 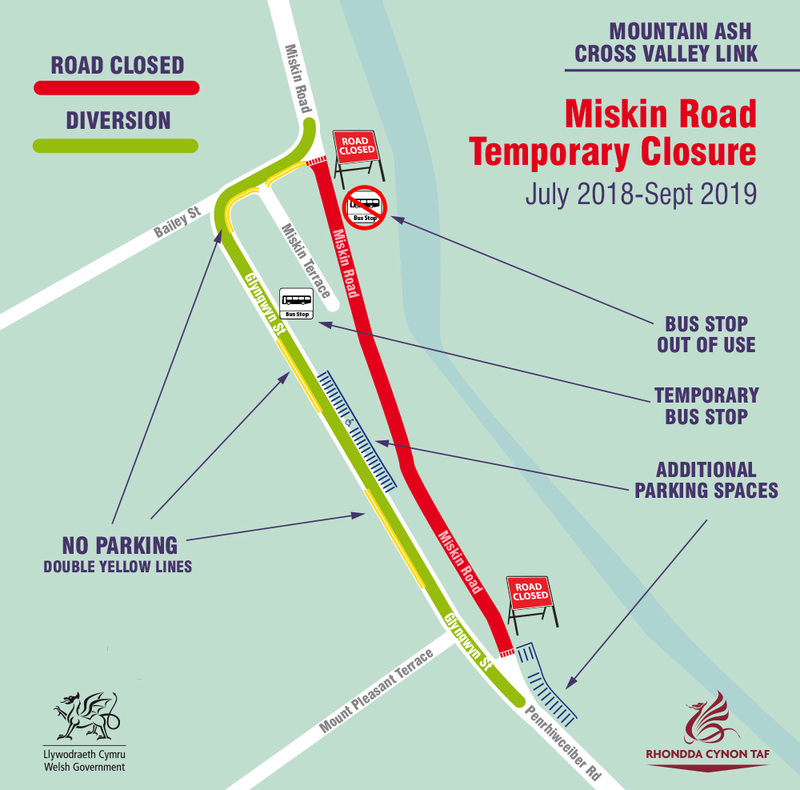 The Council has now announced details of the necessary closure of a section of Miskin Road, starting at 10am on Monday, July 2, and ending in September 2019. The Council’s contractor for the scheme, Walters-Sisk, displayed the traffic management plans for the works, and the permanent arrangements thereafter, at a public exhibition at Miskin Baptist Church on May 23. The closure will affect the one-way section of Miskin Road, which is between its junctions with Bailey Street and Glyngwyn Street/Penrhiwceiber Road. The alternative route for motorists is via Bailey Street and Glyngwyn Street. During the works motorists will not be able to park on sections of Glyngwyn Street, nor sections of Bailey Street between its junctions with Glyngwyn Street and Miskin Road. This temporary traffic order, starting on July 2 alongside the Miskin Road closure, will minimise traffic congestion on the diversion route. However, additional parking for residents is being made available by the Council’s contractor at Glyngwyn Street and Mount Pleasant Street. Both will be completed in time for the start of the Miskin Road closure on July 2. The Council would like to thank residents for their continued cooperation throughout the duration of the scheme.